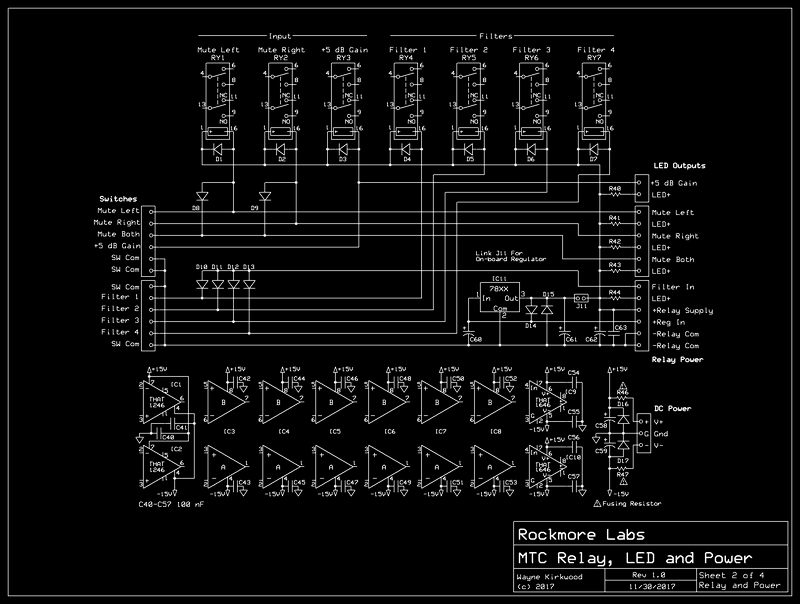 This thread is a preview of the Mastering Transfer Console input, filter and balanced output PC board for simple vinyl transfer. 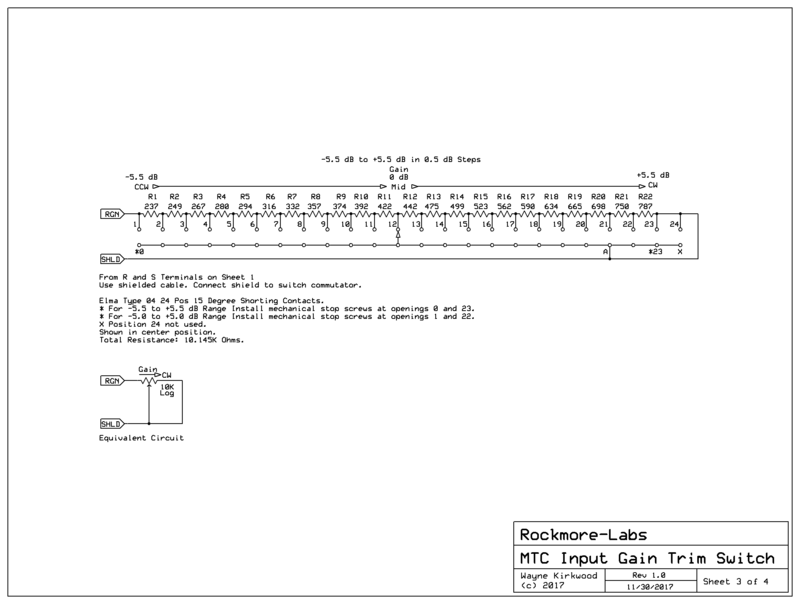 FET or transmission gate switching tends to be frowned upon in transfer consoles. There are only electromechanical solutions. 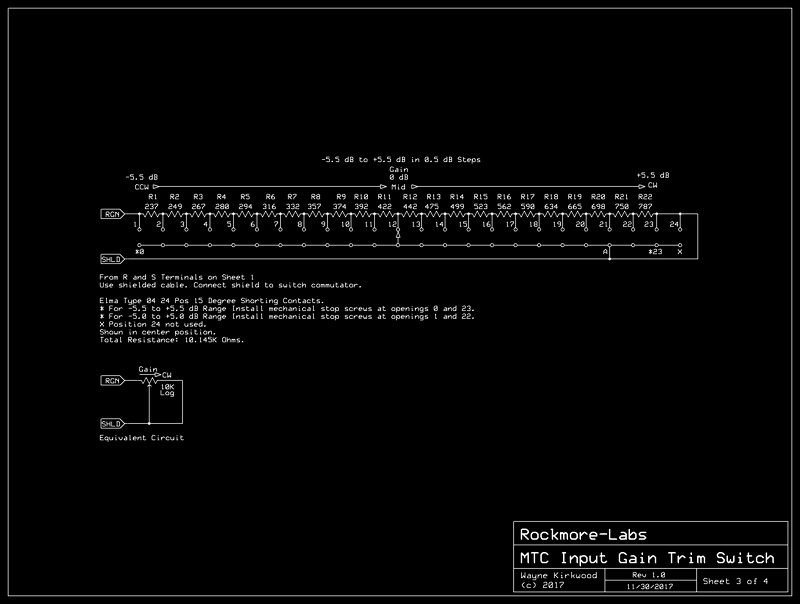 A four channel modulation plus preview transfer console for example would require an incredibly expensive 8 pole switch. 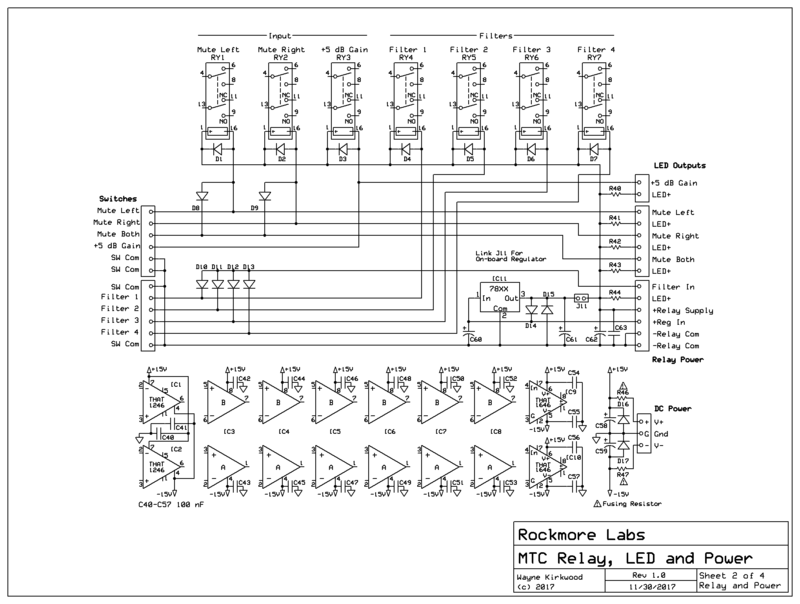 Duplicated filters with switched outputs require lots more components and PC board area but is far less expensive than a big, long, hard-wired switch. There are three bill-of-materials. One is for the base IGFO board, the second for the gain switch, the third for the filter tuning resistors. 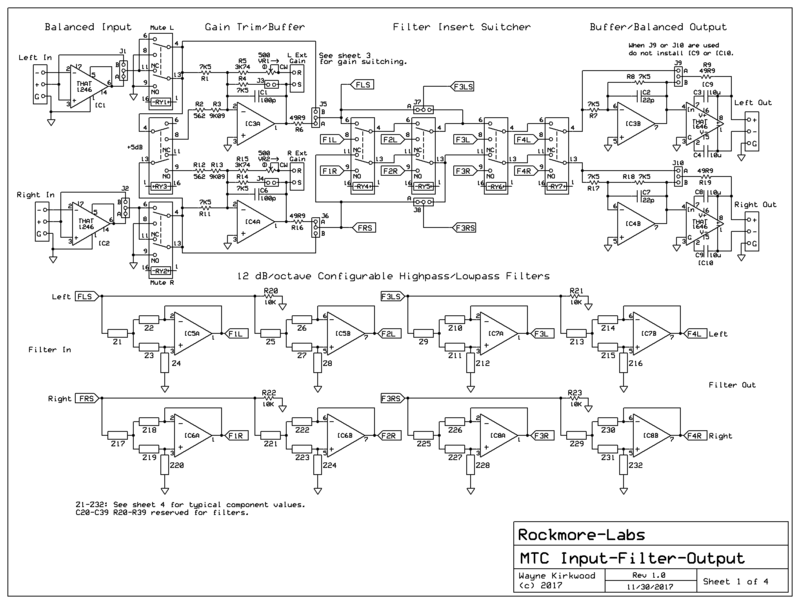 This is for the MTC-IFGO board configured for 2 HP and 2 LP filters. It includes THAT ICs and capacitors for filters. It does not include resistors to tune the filters or resistors for the gain switch. Each build is a unique. 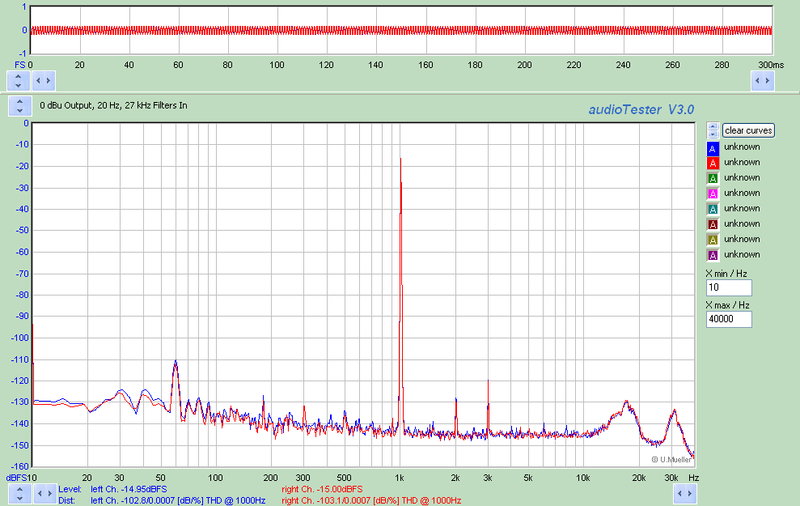 This list has the values for 20, 30, 40, 50 Hz HPF and 12, 14, 16, 18, 22 and 27 kHz. 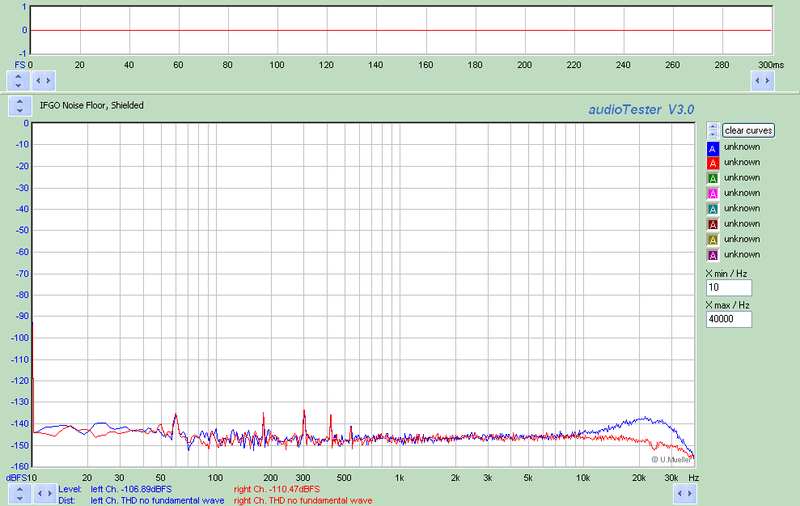 VR1 calibrates the lowest gain step to exactly -5.5 dB. Looks great Wayne! I wish I had this to start with when I started building my console. If I was building it I'd probably make the filter section with two frequency choices but make each switchable between two pole and three pole. I think that would work with the way it is. 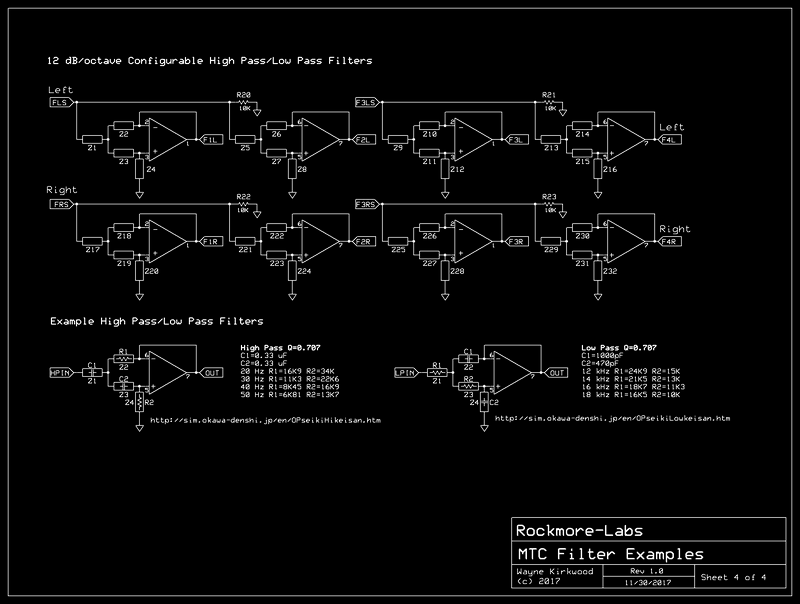 I may re-use part of this layout to do the Universal Active Filter I described in another thread. 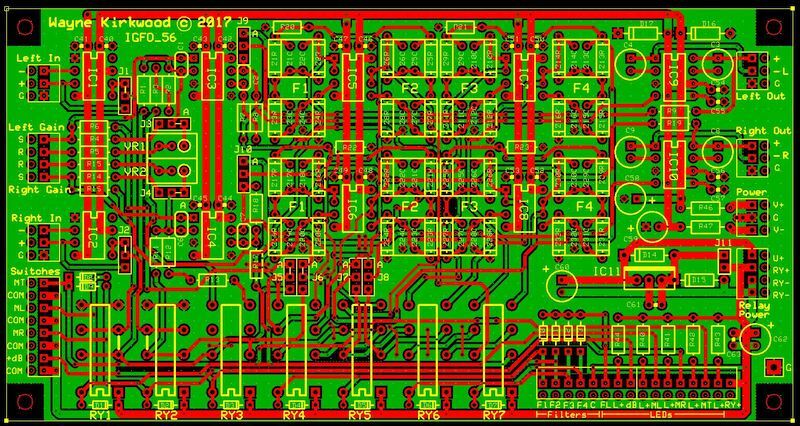 The Mastering Transfer Console Input, Gain, Filter, Output "IGFO" Boards are on order. If they checkout OK will have a few extra. 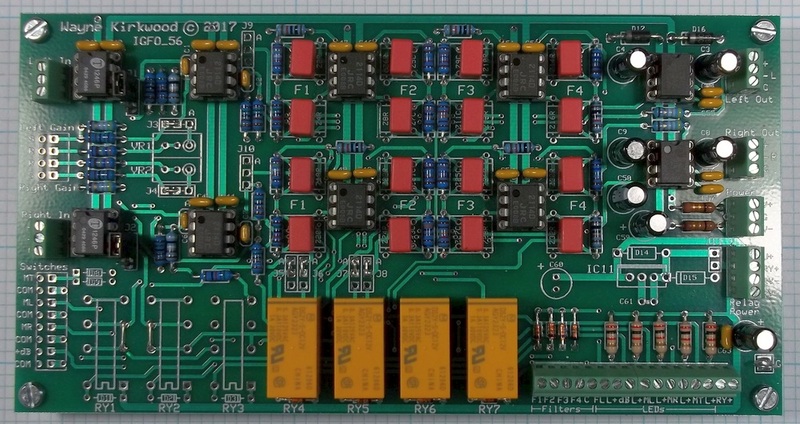 An Input, Gain, Filter, Output board for mastering transfer. 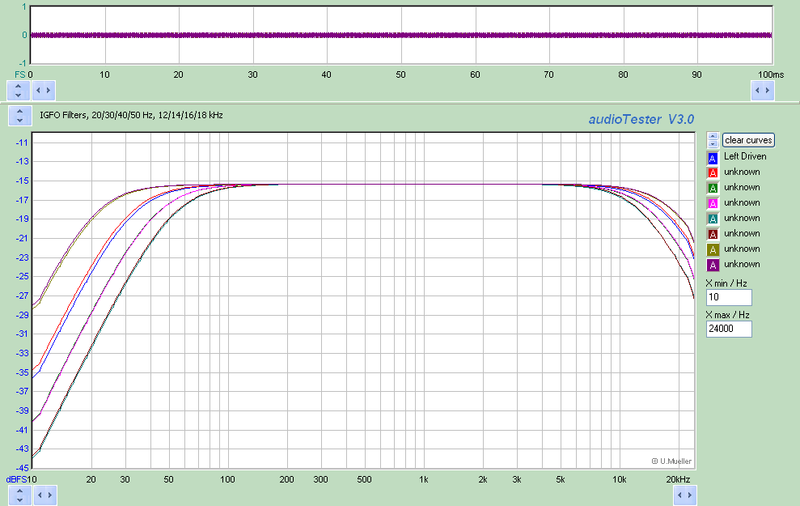 The above was constructed with two 12 dB/octave high pass filters at 20 and 30 Hz. 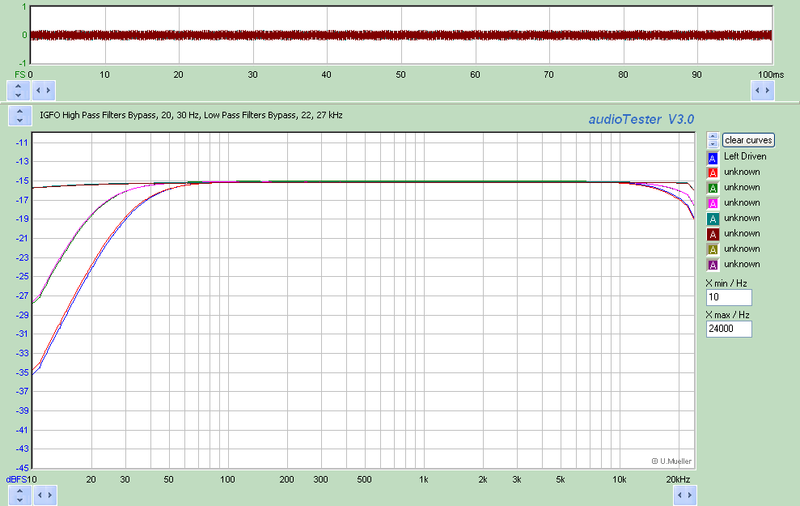 The second pair of filters are low pass at 22 and 27 kHz. Capacitor/resistor placement on the PC board determines whether the filter is high or low pass. 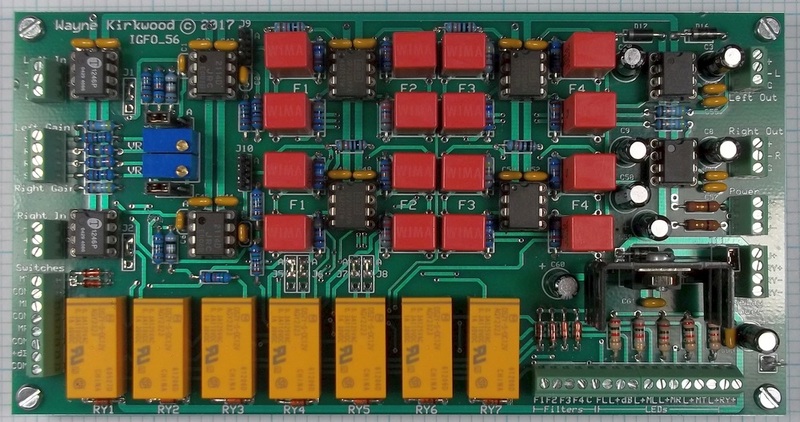 The boards can be cascaded to provide more than four filter frequencies. 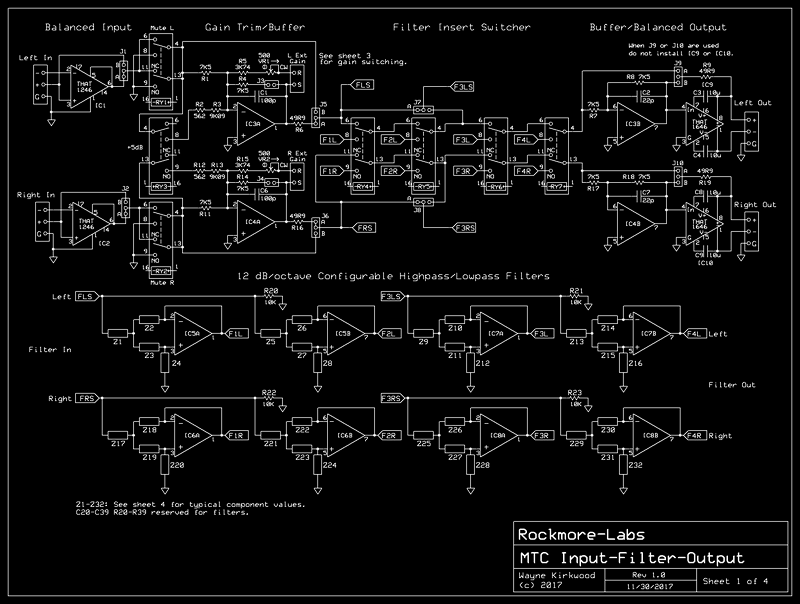 This is the filter response for the IGFO board built for 20, 30 Hz HPF and 22, 27 kHz LPF. The DAC used to plot this has 22 kHz output filters (despite its 96 kHz sample rate) so above 22 K the steep roll off seen with the filters bypassed is not real. Didn't even respond to your email.. shame on me.. 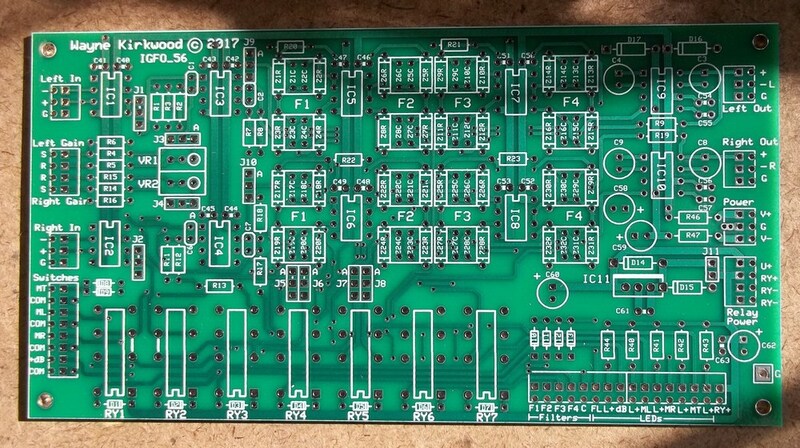 I wanted to share some pics of an 8 filter 2 board build I did for tape-to-vinyl. The first board has the input with stepped gain, high pass filters at 20, 30, 40 and 50 Hz. 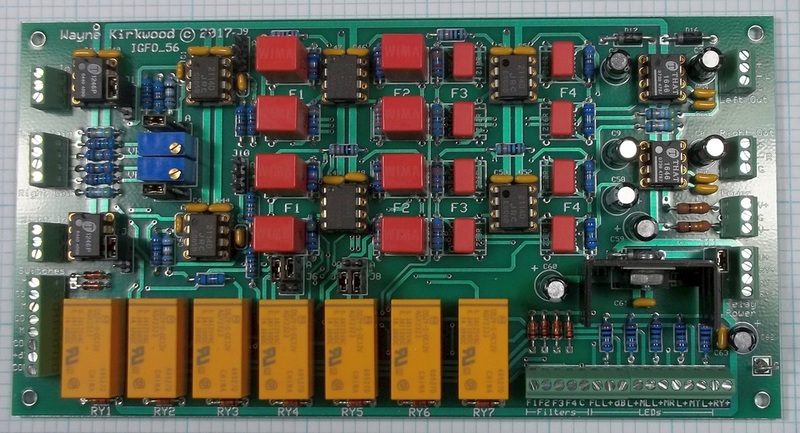 The second board has 12, 14, 16, 18 kHz low pass filters and the final output. A balanced insert is available between boards. The final system has preview which requires four boards. 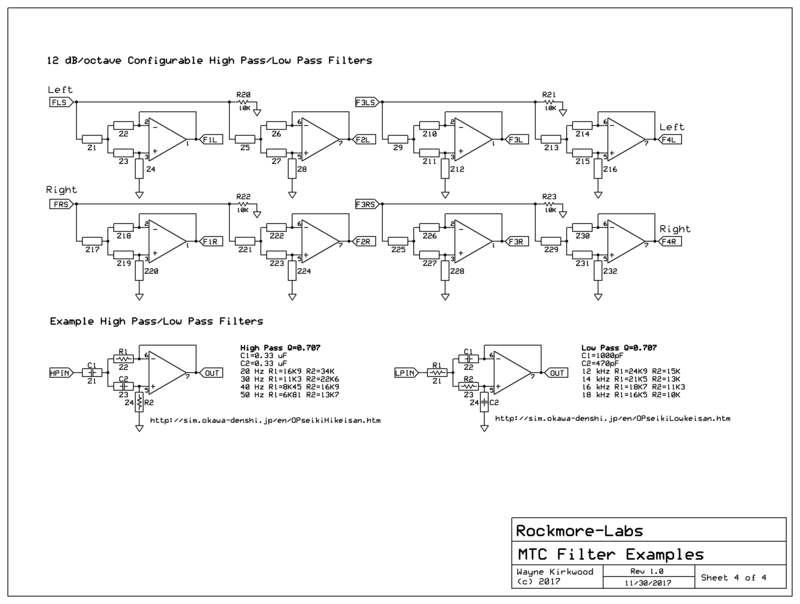 Switching all four filter channels only requires two single-pole rotary switches: One for the high pass and one for the low pass. The total BOM for the two boards, excluding the bare PC boards, is about $220 US which is far less expensive than the two 8 pole switches needed to tune 4 filters. Wanted to let everyone know that boards are on order and production quantities of the MTC-IGFO Input/Gain/Filter/Output board will be available for shipment around Thursday January 18th.